Directed and Written by: Francois Simard, Anouk Whissell, and Yoann-Kari Whisse. Starring: Munro Chambers, Laurence Leboeuf, Michael Ironside, Aaron Jeffrey and Edwin Wright. Synopsis: A kid tries to survive in a post-apocalyptic earth while avoiding an evil crime lord. This review originally ran as part of our DIFF 2015 coverage here. There's a small but awesome subgenre of movies that homage the look of older movies. My buddy calls them "Modern Retro", which sums it up really well. Most notable of these are the works of the Canadian film collective Astron 6, with movies like MANBORG, or with director Jason Eisner's HOBO WITH A SHOTGUN. 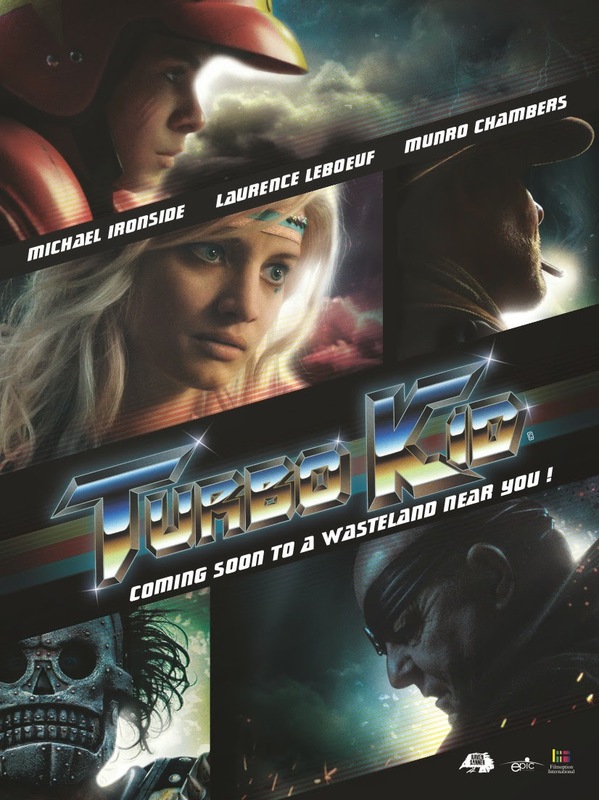 Following in the footsteps, we have directors Francois Simard, Anouk Whissell, and Yoann-Kari Whisse's love letter to post-apocalyptic movies, TURBO KID. Set in the distant future of 1997, TURBO KID follows "The Kid," a scavenger trying to survive in this toxic wasteland, and his fight against the local crime boss. There's a very fine balance that these types of throwback movies need to strike between substance and style. It's very easy to have cheesy dialogue and a pulsing synth score (which this movie does) for the sake of having it, but those elements are no good if they don't help the story. TURBO KID ends up taking cues from the past and using modern sensibilities to tell a fun and comedically violent story. First, the universe that's been established here is thorough and should be explored further. The sharp script hints at the culture that has developed since the apocalypse happened, but it never hits you in the face with it. It's neat to see the brief scenes of the struggling civilization. There's a whole subculture of bounty hunting, scavenging, and arm wrestling for social status that's developed and everyone has crazy outlandish costumes. And the best part? Everyone is rocking bikes as their major mode of transportation. Unlike the festival audience that I saw the movie with, the movie doesn't treat this as a joke. As cool as MAD MAX and the ROAD WARRIOR are, it really doesn't make sense that cars would be used in a post-apocalyptic world. And yeah, at first glance it can look goofy, it also gives the world a stronger "survival of the fittest" aspect since you have be strong to pedal quickly to get away from saw-wielding masked maniacs. The cast is lead by Munro Chambers as "the Kid" who is a resourceful scavengers living out on his own who loses himself in his Walkman and Turbo Man action figures and comics. Aaron Jeffrey plays a cowboy-esque badass who's the arm wrestling champion of the little town, and Michael Ironside plays the main baddie, Zeus. Between Jeffrey and Ironside, they're chewing the HELL out of the scenery, and they look like they're having so much fun. But the true stand out of the movie is gorgeous Laurence Leboeuf as the Apple, who decides to be the Kid's best friend. Her performance is something special and brings a lot of heart and humor to the story. If there's going to be a critique of the movie is the rather episodic nature of the story. The parts that are between action scenes always feel like mere setups for the next sequence. Given how this was written, it would actually feel TURBO KID could work better as a six episode mini series. Or you know, the sequel could work as that. Also, there's some anachronistic details about the world that CAN make you pause such as some very advance robotics tech and weapons, when all the while this is supposed to be 1997 and the apocalypse has been around for a number of years already. All of those are really mild critiques because honestly, when you're watching the movie, you are having so much fun and everything is handled in a way that you really don't question it. TURBO KID is a unique throwback movie with so many fun elements, and you can tell that a lot of love went into it and to be honest there's nothing better than a passion project.